Let's begin with another 72 Hour Recap, and brace yourselves people, because sh*t just hit the fan. Also, I'm apologizing in advance for the all the CAPS. We were left in last week's episode with Jon and his misfits headed north to capture the dead, a Tyrion/Jaime reunion in which plans of bringing all the Queens and Kings together were kindled for the greater good, and finally, per usual, Littlefinger being up to no good. We open this week with Jon & Co. trekking through the cold and blustery north of the north, mostly filled with bickering between brothers and working through their man problems together. We do get a very somber moment between Jon and Jorah when Snow tries to give Mormont his rightful sword during a game of "who's the Noblest of them all." Jorah wins. Jon keeps the sword. Very endearing. Then they get attacked by a giant dead bear, Jon seems to be more and more convinced by this whole "Lord of Light" muck rack, and eventually they track down a small horde of wights and capture themselves a good cookie to take home. 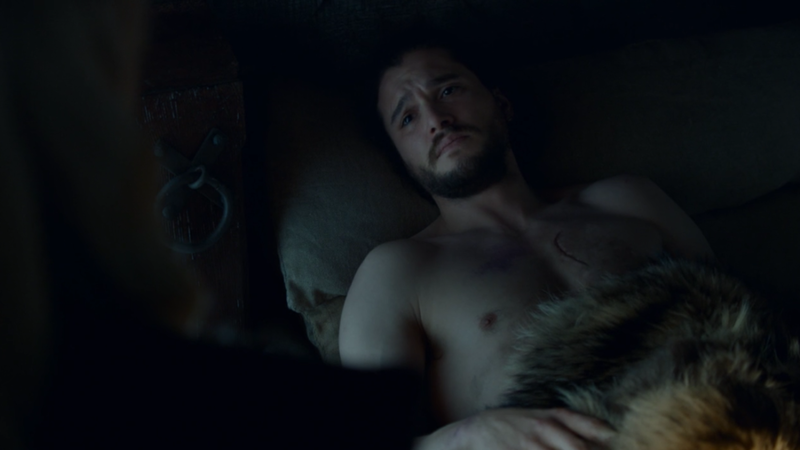 However, before they can make their merry way back to Dany, the good cookie starts howling bloody murder, Gendry gets sent off to send a raven, and Jon & Co. end up trapped on an ice cube island surrounded by thousands of bad lil' wights who are too afraid to cross the cracking frozen lake and thus a waiting game begins. This is all fine and dandy until the Hound decides to play dodgeball with a deado which ultimately causes the ENTIRE WIGHT ARMY to charge through the frozen lake right at Jon & Co... but we'll come back to this. Meanwhile in Winterfell, Littlefinger is getting exactly what he wants— for the Sansa sisters to turn on each other. Angry Arya confronts Sulky Sansa with not-so-subtle threats, causing Sansa to try and find secrets about Arya, but then Arya finds Sansa and tells her about being faceless and how fun it is and how she should really try it out some time #bonding #yay, and we end there with Arya REALLY not-so-subtly threatening Sansa but then giving her the blade. Ultimately, Sansa sends Brienne of Tarth off to King's Landing for the meeting of Queens/Kings/All-Major-Characters-Still-Alive, to somehow thwart whatever plan she thinks Arya has against her. Very tense, very angsty. Both these sisters need a time-out. OKAY, so back in Danyland— Dany and Tyrion squabble about this King's Landing meeting for basically the whole episode until Gendry's raven arrives asking for some ASAP help. Dany takes her dragons and flies off to rescue Jon & Co., once again leaving Tyrion to look really tiny on a cliff. Then, right when everything goes slo-mo and Jon has that sad-faced defeated look a la "Battle of the Bastards,"
Dany comes to save the freakin' day, DRAKARUSing her way through the wights for a truly, truly epic entrance not even KISS could compete with. 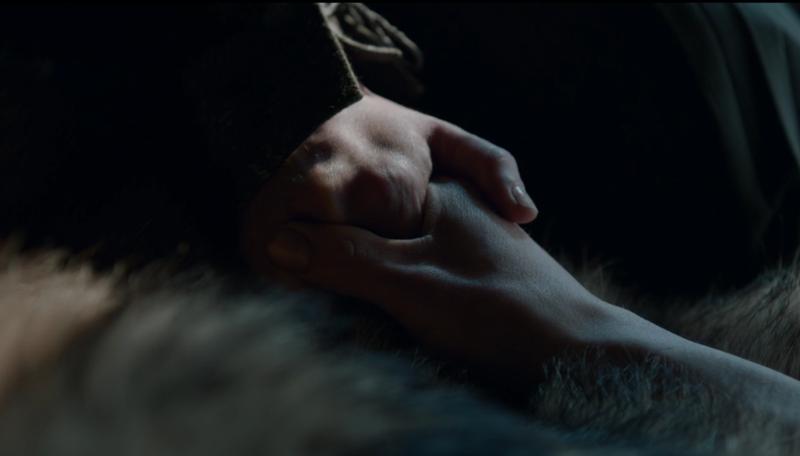 I really can't even with this episode, because then Jon decides to KEEP FIGHTING after climbing out of a frozen lake and will surely die until he's saved by none other than Uncle Benji *heart-melting*. But, in following the "Two Minutes of Winning" rule, GOT kills off Benji (I mean, he's dead already but still) as he's staving off wights from Jon. BUT AGAIN, GAME OF THRONES COMIN' AT YA WITH THEIR TWO MINUTE RULE because if you thought that her dead dragon found its grave in that lake, you'd be wrong! Where does a girl get a coat like Dany's? Like who made that? And when? 1. How is Sulky Sansa going to screw up everything— Is she going to betray Arya, or worse, kill her? 3. What's Cersei's game plan? We know from the last episode that she and her creepy dr. were conspiring together for this meet-up. 5. Who's going to die in the finale? We haven't seen Yara or Euron in weeks... perhaps a Greyjoy death? Also maybe Jorah, I think his time is coming to a close. Something wicked this way comes y'all. Something real dang wicked.